Biosensors are essential to an ever-expanding range of applications, including healthcare; drug design; detection of biological, chemical, and toxic agents; environmental monitoring; biotechnology; aviation; physics; oceanography; and the protection of civilian and engineering infrastructures. 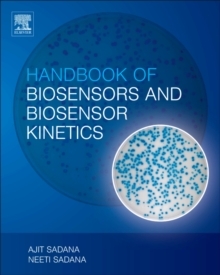 This book, like the previous five books on biosensors by this author (and one by the co-author), addresses the neglected areas of analyte-receptor binding and dissociation kinetics occurring on biosensor surfaces. Topics are covered in a comprehensive fashion, with homogeneous presentation for the benefit of the reader. The contributors address the economic aspects of biosensors and incorporate coverage of biosensor fabrication and nanobiosensors, among other topics. The comments, comparison, and discussion presented provides a better perspective of where the field of biosensors is heading.